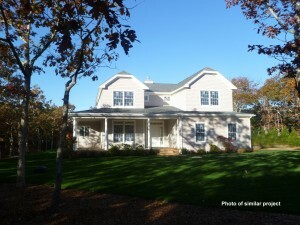 New Listing: 108 Martha's Road, EDG - Sandpiper Realty, Inc.
New contruction, ready for occupancy this summer! Bright and expansive with 3,300 square feet of high quality craftmanship. Open floor plan, perfect for entertaining and provides casual comfort for family and friends. Great room with gas fireplace and custom built-ins flows to the gourmet kitchen, featuring granite countertops and center island with breakfast bar and to the dining area. The great room and dining also lead to the screened porch. More living space is found in the cozy sitting room at the front of the house. First floor master with ensuite and walk-in closet, well appointed powder room and laudry area complete this level. The second story houses three guest rooms, two baths and family room. High efficiency 4 zone heating and cental air-conditioning and energy saving hot water system make this both economically and environmentally friendly. Two car garage, front porch, rear mahonany deck and professionally lanscaped grounds with irrigation top off this well designed property. All perfectly situated to accommmodate future pool and pool house. Located on 3/4 of an acre in Island Grove, a private neighborhood that offers close proximity to both the Village and South Beach and association tennis.